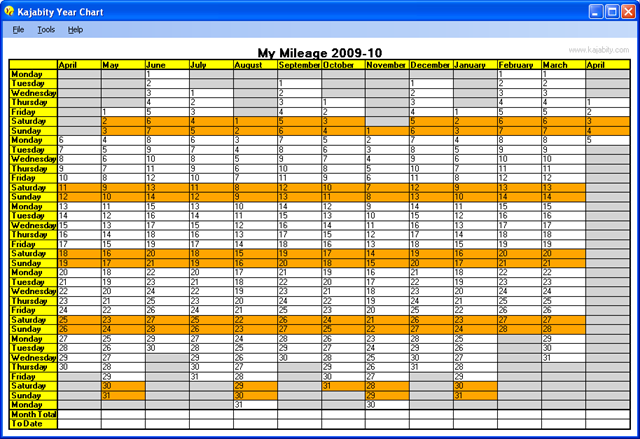 Create a printable day-to-day chart for any range of dates from 1 day to 5 years with Kajabity YearChart. Download Kajabity YearChart now (it’s free!) if you need to produce a Financial Year planner, Academic Year Planner or any chart for any number of days. It’s a lot easier than trying to set it all up in a Spreadsheet (I know, I used to do this in Microsoft Excel and got fed up with it). Print a Year Planner for any year or any range of dates up to 5 years. Print on any size of paper your printer can print to. Includes Print Preview and Page Setup. Customise the title and first day of the week. Add extra labelled rows or columns to the chart. For more features and details of changes, bugs and fixes in the latest version visit the Release Notes page. Kajabity YearChart is Open Source, released under the Apache License, Version 2.0 – a ZIP with the C# sources is available on the Download page and I will (eventually) publish articles on how it was written.